The Big Green Egg stands alone as the most versatile barbecue and outdoor cooking product on the market, with more capabilities than all other conventional cookers combined. 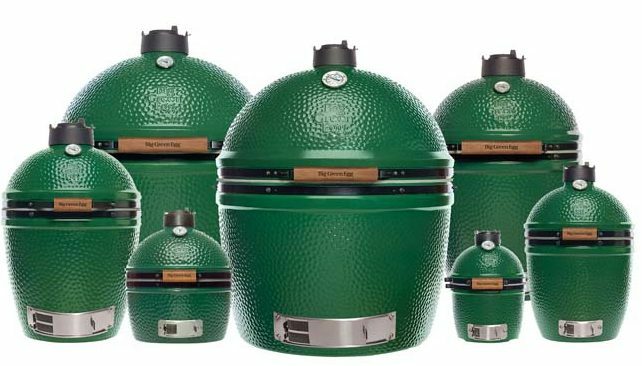 From appetizers to entrees to desserts, the Big Green Egg will exceed all your expectations for culinary perfection...and with seven convenient sizes to choose from, there is a Big Green Egg to fit any need and lifestyle! Sear the perfect steaks, pork chops or burgers on the EGG. High temperature “steak house” grilling –even at 750º F / 400º C – is quick and easy! Using the two dampers for accurate control, you can lower the heat to a more moderate temperature for other grilled foods. Fish and seafood turn out moist and tender with a flavor-packed crust unmatched by other grills. Using the indirect cooking method with a convEGGtor, the Big Green Egg bakes bread, pizza, casseroles, cobblers and pies better than your kitchen oven ... you may never cook indoors again! The Big Green Egg retains heat and moisture so well that foods don’t dry out! Poultry, lamb, beef and vegetables are naturally tastier because the juices and flavors stay locked inside.